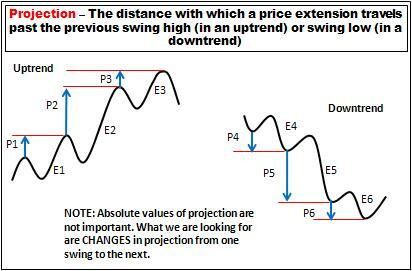 Projection refers to the distance with which a price extension projects past the previous swing high (in an uptrend) or swing low (in a downtrend). Referring to the uptrend in the above diagram, we see the price action shows three price extensions E1, E2 and E3. The projection of each is displayed as P1, P2 and P3. P1 is the distance with which E1 projects (or travels) beyond the previous swing high. P2 is the distance with which E2 projects beyond the previous swing high. And P3 is the distance with which E3 projects beyond its previous swing high. The important information is not so much the distance, but changes when comparing one projection with the next. Note the increased projection of E2 (P2) when compared with E1 (P1). Extension E2 projects much further than E1 did, indicating greater strength within the trend. P3 is then much shorter than P2, indicating weakness developing with the trend. The downtrend shows similar information. Projection P4 is the distance with which Extension E4 travels past its previous swing low. And so on for P5 and P6. P5 shows greater distance than P4, indicating increased downtrend strength. P6 shows a decrease in projection compared to P5, indicating possible downtrend weakness. Increased projection is a sign of potential trend strength. Decreased projection is a sign of potential trend weakness. For more information on how to use this, including chart examples, please refer to Section 3.2.2 of the YTC Price Action Trader. Nice and easy for recognizing an upcoming reversal and holding your horses – Thanks Lance as always.